Now that we have finished with Black Friday and Cyber Monday, which is apparently the busiest shopping period of the entire year, think about whether you are better at receiving gifts or giving gifts. Enjoying being a giver is a fundamental mindset that I would encourage all of us to embrace this holiday season. Even if we don’t attend church or read the bible, most of us have heard the scripture, “It is more blessed to give than to receive” (Acts 20:35, NIV). Truer words could not have been spoken. Sure it is fun to snoop under the Christmas tree to see if any of the beautiful packages are for you, and to try to guess the contents of the packages, hoping and anticipating with excitement the element of surprise as you are opening them on Christmas morning. But it can be just as exciting to give a gift. It is fun to watch the smiles on other people’s faces and the joy they get from receiving something you picked out for them. Or maybe you have made a gift for someone special in your life and are now bubbling over with patient joy as you can’t wait for them to discover that it was hand-made by you! Presents of material worth are not the only type of gifts that you can give. 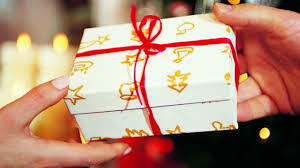 Think about gifts that are not of material value that you can begin to give to others during this very busy season. A kind word to a clerk in an over-crowded department store or helping your next door neighbor bring in their groceries are all gifts that are priceless, for they are gifts of kindness and thoughtfulness. These gifts tell the people in your life, “I care”. I also would encourage you to find people every day to Just Say It to, “I care”, and watch their reactions to you and also watch how your relationship with them changes, especially if you continually make statements such as these positive, affirming statements to the people in both your inner and outer circles. Giving to others truly demonstrates love, compassion and kindness towards them. Giving to others also shows that you love God. Giving gifts is really better than receiving them!